Whew, does your life sound like that? Literally what gets me through the day is a chance to sit down with well…a snack like this! Like this Easy Candied Popcorn! You know that I love popcorn around here. Other than ‘vegan ice cream‘ it is my top favorite snack…or dessert. Or both. Do you remember when I made Candied Eggnog Popcorn last Christmastime? This recipe follows loosely along that same recipe…except we tweaked it a bit to make it even more ‘candied’. So what makes this version different? Well…I added a bit more sugar and used cream of tartar. I also increased my baking soda which makes the ‘candy’ foamy and thick but then after a few minutes on the popcorn it gets hard like candy! AND this part is important, I kept my air popped popcorn warm in the oven while I made the ‘candied part’. 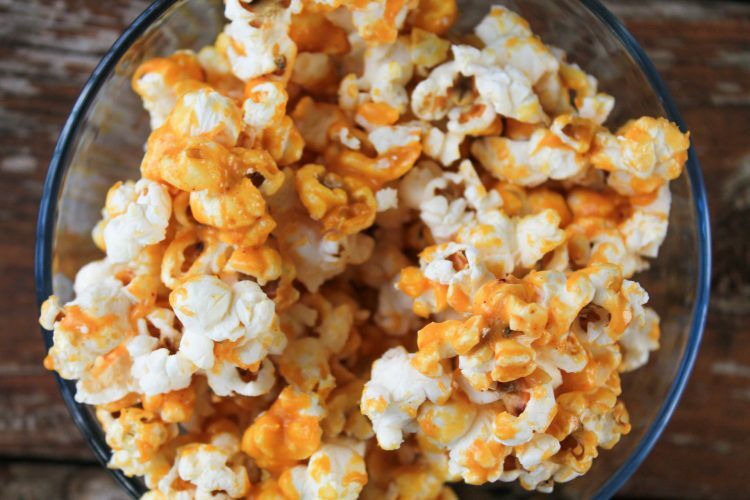 Another important preference is to use yellow popcorn kernels – not white! They produce a much fluffier popcorn kernel. I am so excited about this easy candied popcorn! Now to get it this ‘orange’ color which I thought was super fun for Halloween, I used McCormick’s Color from Nature powders. Just think of the possibilities for every holiday! Red candied for Valentine’s Day. Green and Red for Christmas. Pink for Easter. Oh! I am so excited to make this easy candied popcorn at every holiday! Or even turn it into a popcorn ball. If you make this recipe, I would love to know! Tag @badtothebowl so I can crunch and munch with you! 1. Prepare air popped popcorn. Place in 200 degree oven to stay warm. 2. Combine granulated sugar, agave nectar, coconut oil, salt and cream of tartar in small saucepan on stovetop. 4. Continue to boil until thermometer reaches 250 degrees. DO NOT STIR. 5. Take off heat and immediately add baking soda. Stir well. 6. If adding color: at this point, divide mixture into as many different bowls you wish to color. Add color and stir well. 7. Take warmed popcorn out of oven. 8. Pour mixture over your popcorn and stir well to coat popcorn. 9. Spread out evenly on on parchment or wax paper lined baking racks. 10. Cool completely before storing in containers.